Allied Hydromulch performs a variety of processes to prevent, and protect against soil erosion. From temporary to long term soil erosion blankets, application of BFM (Bonded Fiber Matrix) products such as Hydro-Blanket, and FGM (Flexible Growth Medium) products such as Flexterra. We work with our clients and their environment to provide the best soil erosion protection for the project. We also use hydraulic applications of soil sealing, bonding materials, and dust control products in soil erosion protection. 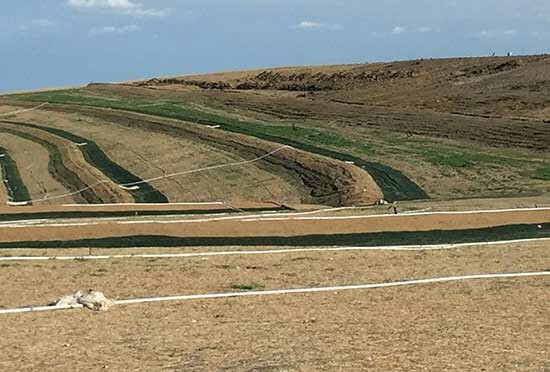 Additionally, we can supply and install grass sod on erosion sloped channels and inlets in high rain fall and water erosion areas for further soil erosion protection. FGM includes ground dehydrated wood pulp that expands upon contact with liquid to hold in moister and bond to the soil. Here Allied Hydromulch applied FGM to the slopes of a retention pond in NW Houston to prevent future soil erosion. Above is an erosion blanket application at Sunset Farms Landfill in Austin, Texas. Erosion blankets are used in projects such as this where the area is prone to soil erosion because they do not break down.